First, I'm not little Mike. Second, in the latest version (not posted online yet), if you're on the last step and press the >> button, it will automatically rewind. FYI, this is a web page, not an App. The iPhone will let you save a web page as an app if the web developer does a couple things. Android doesn't do this, so Android users will always need an internet connection. iPhone folks won't need internet if all goes well. Also, these graphics wont scale, so the folks with larger phones will have empty space on the bottom. I've scaled this for earlier phones like the iPhone 4S, so even iPhone 5 users will have extra space. 1. I'd have to write two apps, one for Android and one for iPhone, forget Microsoft. They'd be two different code bases with two different bases to update whenever there's a change, and Android phones come in too many different versions and have too many different operating systems for me to want to mess with. 2. Apple would charge me $100/year to have it on the App store for you to download. Makes sense to me, and sounds good. goestoeleven wrote: Just one thought- swiping skips the animations, at least on Android. Any way to have the forward swipe run the animation, instead of going to the next slide? I have the forward and back swipes equivalent to the forward and back buttons. Though I can see the utility of the forward swipe equals the play button, it makes the back swipe counter-intuitive. At least to me. I welcome opinions. Finally had a chance to try this on my Note 2. Big screen android 4.2. Works and looks fine. Echoing all the things previously said. That's great to hear Mikey. And thanks everyone for your feedback and checking how it works on your various devices. It's invaluable to me since I don't own a bunch of phones! Here's a new version to play with. It has more figures. This is still a rough draft, but I welcome and desire feedback. For example, does the "How Team Flying Works" page look like this? With the differences in text rendering on different devices, I'm wondering if the little graphic showing the line of kites appears in the correct place in the text? Main menu doesn't display fully in landscape mode on iPad 2 or iPhone 4. Can't make it scroll, have to turn the device. Looks good in Chrome on Android. I would suggest scrolling the content the other way, and having the menu button at the top left instead of the right. It feels backwards compared to what apps typically do. KiteVoice wrote: Main menu doesn't display fully in landscape mode on iPad 2 or iPhone 4. Can't make it scroll, have to turn the device. It scrolls on Android, but you have to grab somewhere that is not a section selection to move it, and that space is limited. Yeah, it works best in Portrait mode. Some versions of Android wont support scrolling so I decided to give up scroll bars for all devices. The animations wont fit in landscape mode anyway. Jeff wrote: Looks good in Chrome on Android. I'll reconsider that. Some apps have the menu on the right and this fit better since the Text is on the left and I have limited space. But I'll play around with it to see if I can do something different. Thanks a bunch for the feedback, keep it comin'. 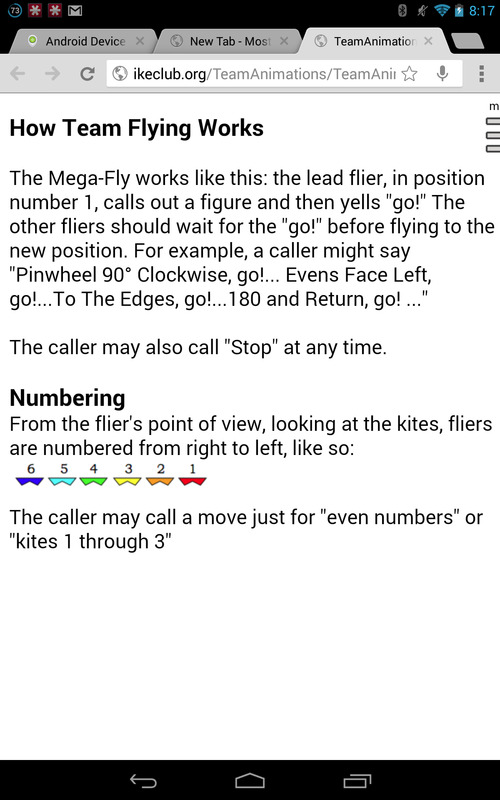 By the way, Android folks, the question I asked up in post #25 about the "How Team Flying Works" page: Does the row of kites line up correctly in the text? Thanks for the screenshot, that's very helpful. The lines break in different places, but it still works. But wait, is the Menu icon cut off? Mike wrote: Thanks for the screenshot, that's very helpful. The lines break in different places, but it still works. Oh, the page is just ever so slightly zoomed in. I must have done that accidentally. When your device is turned sideways on the opening screen, it's difficult to scroll with one finger. But you can scroll with two fingers on an iDevice. Is that also true with Android? Wouldn't have guessed it, but yes, you can. Looks like it's more a side effect of multi touch zooming where you can reposition the whole page while zooming instead of an actual scroll event. Maybe Mac people think of it earlier because you scroll with two fingers on a trackpad. But if *you* didn't think of it, then I'm thinking most Android users wont either. Mike wrote: Maybe Mac people think of it earlier because you scroll with two fingers on a trackpad. But if *you* didn't think of it, then I'm thinking most Android users wont either. Actually, I can scroll that way on my HP laptop and Chromebook trackpads, I just didn't think of it for a tablet interface.